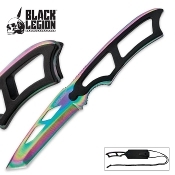 The Rainbow Tactical Neck Knife is the newest in Black Legions self-defense arsenal. The super sharp 3" full-tang 3Cr13 stainless steel blade has a rainbow titanium finish. It has a strong, impact-resistant ABS handle and is housed in an ABS sheath. The handle is ergonomically constructed so that it has a comfortable, secure grip. It's 6 3/4" overall.